June 26, 2011 by Alphageek in "alphageek", "review", "urbanspoon"
There is one word I like to use to describe Carl's Ice Cream: Unique. 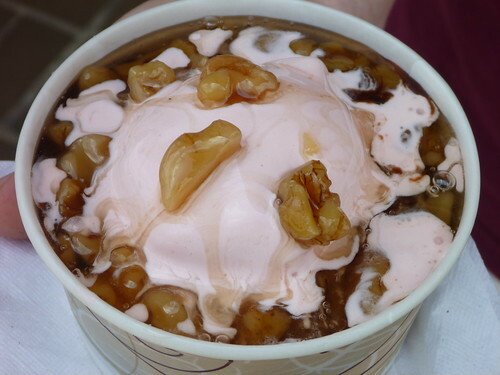 Carl's Ice Cream is unlike any other ice cream place of its kind. You can argue with the Alphageek if it is the best or not, but just remember you can only get this ice cream here. In the days of chain restaurants everywhere, it is a great break to stop by and get something unique. Sure, maybe the soft serve at some yogurt place is smoother, or some other overused superlative, but that food was probably made first in a laboratory somewhere, and the sprung on the public at the end of some boring science experiment. 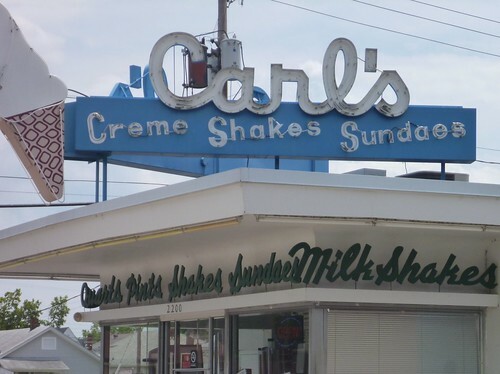 Here at Carl's you get simple ice cream that has been made this way for years. We stopped by and got a couple of ice cream sundaes. I got hot fudge and vanilla. It was simple and great. Mrs. Alphageek got a strawberry sundae with nuts, which you can see below. Sorry about the picture, but we wanted to eat before everything melted! One simply cannot beat the simple pleasures of simple food well done. That's what we love here at Alphageek Talks Food and Carl's always delivers. No need for a long, drawn out review either, Just stop by if you are the kind of person that wants to try something unique.